How fresh is fresh . . . in other words fresh versus frozen? Of course there is also Tallyrand’s recipe of the week to hook into. After requests from many Kiwis and some USA folk, this week it is the classic Lobster / crayfish Thermidor . . . with a few extra’s thrown in also! Like my recipe for an Asian style Lobster / crayfish dish <click here> and I have also updated and extended the purchasing, storing and cooking of lobster / crayfish to be found at my recipe from way back in October, 2000 <click here> I know in the UK these are none too common these days, but in the US and here in New Zealand they are readily available and still quite cheap. In fact all being well, weather permitting I will be diving for my own this weekend with friends along with a spot of fishing. New Zealand waters abound with wonderful seafoods, that can be quite easily gathered all year around and especially this time of the year, (it is summer here in the southern hemisphere) like Pacific and rock oysters, scallops, crayfish, mussels etc. Join me next week when I will be revealing my New Year Culinary Resolutions and an interesting update on my Xmas cake recipe! In the meantime enjoy and languish in these decadent recipes! And if Lobster / Crayfish are not available or not to your liking; try these with your favourite white fish or other seafoods like mussels or scallops . . . not quite as decadent and a whole lot less expensive . . . Bon appetit and enjoy! Traditionally the Thermidor sauce was made with 200gm of roux (flour and butter) however this produced a very heavy and thick sauce. By reducing the roux, a lighter, fresher sauce is produced and is less at risk from burning. This recipe produces such a sauce, that has a good coating/nappé consistency. Consistency may be corrected by adding cream or milk to thin. Beurre manié may be added for a thicker consistency if required (equal quantities of flour and butter kneaded together to form a paste) stir this into the sauce in small amounts until thickness required is reached. I have not given amounts here as I always think it best to add ingredients like garlic, ginger and chilli to suit your own tastes. But as a guideline, for a 1kg lobster / crayfish use two garlic cloves, a small finger size piece of ginger and half a chilli. 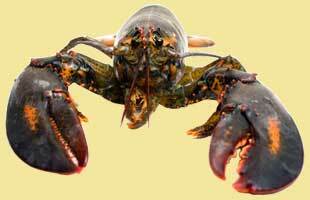 Enjoy your Lobster Thermidor and bon appetit . . . . .